What’s going on in a man’s mind? From their early days, every woman has struggled to understand why males behave the way they do. Even long-married women who think they understand men have only scratched the surface. Beneath a man’s rugged exterior is an even more rugged, unmapped terrain. What bestselling author Shaunti Feldhahn’s research reveals about the inner lives of men will open women’s eyes to what the men in their life—boyfriends, brothers, husbands, and sons—are reallythinking and feeling. Men want to be understood, but they’re afraid to “freak out” the women they love by confessing what is happening inside their heads. 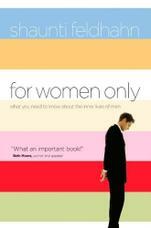 This book will guide women in how to provide the loving support that modern men want and need. What's going on in there? Ever been totally confused by something your man has said or done? Want to understand his secret desires and fears, his daily battles that you know nothing about? In a woman-to-woman conversation you’ll never forget, Shaunti Feldhahn takes you beneath the surface into the inner lives of men. This book is about the things we just don’t ‘get’ about guys. With findings from a groundbreaking national survey and personal interviews of over one thousand men, For Women Only is full of eye-opening revelations you need to not only understand the man in your life, but to support and love him in the way he needs to be loved. Grounded in biblical hope, you will discover how to love your man for who he really is—not who you think he is.